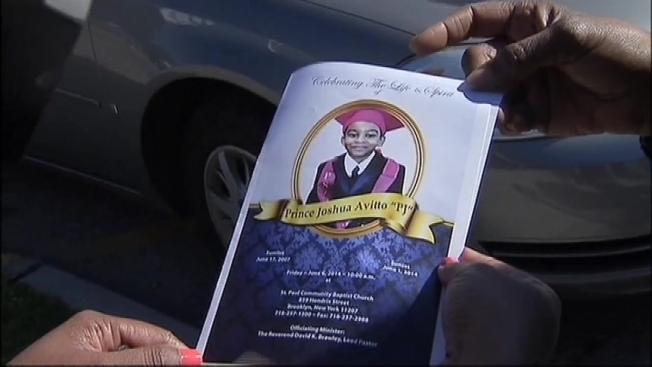 Hundreds of New Yorkers, some crying and others wearing photo-emblazoned T-shirts, gathered Friday to mourn the 6-year-old Brooklyn boy stabbed to death in a public housing project elevator as the man accused of murdering him and badly wounding his 7-year-old friend sat in a jail cell. Mayor de Blasio and the Rev. Al Sharpton attended a private wake before the funeral of Prince Joshua Avitto, known as PJ. The line of relatives, friends and community members stretched around the block outside the St. Paul Community Baptist Church in East New York. Chicago Bulls forward Taj Gibson, who is from Brooklyn and called PJ his cousin, attended the service with Bulls coach Tom Thibodeau. Gibson said of the boy, "He would be like, 'Cousin Taj, pick me up. I'm Superman.'" "That's what gets me every time," he said. "I know him from being Superman. He's invincible." Mayor De Blasio demands review from Corrections Department on how they handled their case of the suspect, Daniel St. Hubert. Jonathan Dienst has the story. "It was like he was my age. That's how I looked at it," he said, adding: "It's hard being here around my aunt. She's the strongest woman in my family 'cause she raised all of us. It's hard to be here." Neighbor Barbara Gholston said she suspected there would be a big turnout for PJ, who she described as "such a sweet kid." His preschool teacher Janet James said "he was loved by so many, a loving little boy." Police are probing whether a suspect accused of stabbing two children in a Brooklyn elevator on Sunday may be connected to a stabbing in a Chelsea subway station three days later, police say. Jonathan Dienst reports. Slideshows of the smiling boy were displayed above the church's main stage; a relative held a poster of Spider-man, one of the child's favorite comic book characters. "We've come today to celebrate P.J. 's life," the Rev. David Brawley said. 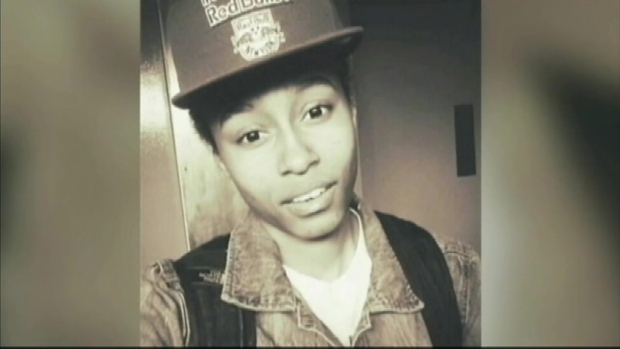 "But we must acknowledge that his life was ended way too soon." There was some at least a piece of good news during the service: PJ's 7-year-old best friend who survived the stabbing, Mikayla Capers, is out of ICU. The announcement touched off a "jubilant" moment among those gathered, according to Brawley. Police are probing whether a suspect accused of stabbing two children in a Brooklyn elevator on Sunday may be connected to a stabbing in a Chelsea subway station three days later, police say. Checkey Beckford reports. "We're excited about that and hopeful for her," he said. After the service, PJ's body was taken out in a small white casket and put into the hearse to go to a crematorium for a private, family-only service. PJ's father released a white dove outside the funeral home as the crowd chanted the little boy's name. "It was a nice homegoing for him, but it was sad also," said neighor LaWanda Jenkins. "For a little kid that didn't even begin life yet." On Thursday, police charged Daniel St. Hubert, a 27-year-old parolee, with murder and other crimes in the Sunday death of P.J. and the critical wounding of Mikayla. Capers suffered a collapsed lung in the attack. 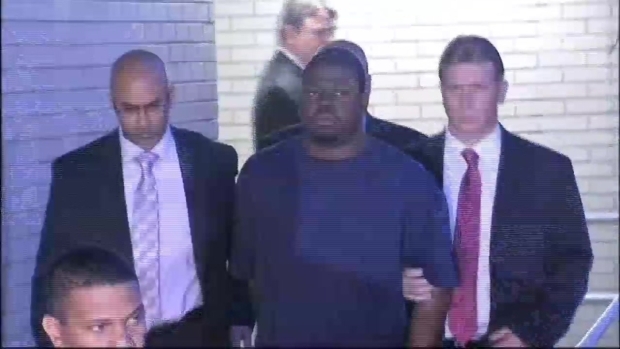 Police have arrested a 27-year-old man on parole for assault in the stabbings of two children in a Brooklyn elevator, a law enforcement official says. Gus Rosendale reports. St. Hubert was arrested Wednesday night in Ozone Park, hours after authorities said preliminary DNA from the knife recovered at the elevator attack scene matched his DNA in a database. Police are now looking into whether he may be connected to two other stabbings, including one in a Chelsea subway station on Wednesday, authorities say. Investigators have said he may also be linked to last week's deadly stabbing of a teen blocks away from where the children were attacked. They say all of the attacks appear random. Police are looking for a man who attacked two children in an elevator, stabbing a 6-year-old boy to death and critically injuring a 7-year-old girl, in what appeared to be a random attack days after he may have also brutally stabbed a teenager nearby. Ida Siegal reports. St. Hubert was paroled on May 23 for domestic assault, and has a violent past that includes attacks on a corrections officer and a police officer, authorities said. He's been arrested nine times in the past, and was committed to a psychiatric facility three different times as he awaited trial in two different assault cases between April 2010 and November 2011, according to court records. In June 2012, St. Hubert pleaded guilty to the two assaults -- one on his mother in May 2009, and one on a correction officer in February 2010 -- and was sentenced to five years in prison and two years in prison for each conviction, respectively. He was allowed to serve the sentences concurrently, and after being credited time served, he was out on parole by May 2014. After failing to show up at a parole meeting Wednesday, St. Hubert was questioned and ticketed by police. Those officers talked to the man before he was identified as a suspect in the stabbings. "This is probably someone who has severe mental health problems," de Blasio said Thursday. "Our country doesn't devote enough resources to it."